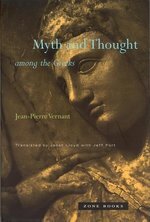 A classic work that rereads questions of "muthos" and "logos" in multifaceted contexts.When Jean-Pierre Vernant first published Myth and Thought among the Greeks in 1965, it transformed the field of ancient Greek scholarship, calling forth a new way to think about Greek myth and thought. In eighteen essays--three of which, along with a new preface, are translated into English for the first time--Vernant freed the subject of ancient Greece from its philological chains and reread the questions of "muthos" and "logos" within multifaced and transdisciplinary contexts--of religion, ritual, and art, philosophy, science, social and economic institutions, and historical psychology. A major contribution to both the humanities and the social sciences, Myth and Thought among the Greeks aims to come to terms with a single, essential question: How were individual persons in ancient Greece inseparable from a social and cultural environment of which they were simultaneously the creators and products? Seven themes organize this stellar work--from "Myth Structures" and "Mythic Aspects of Memory and Time" to "The Organization of Space," "Work and Technological Thought," and "Personal Identity and Religion." A master storyteller, an innovative, precise, and original thinker, Vernant continues to change the narratives we tell about the histories of civilizations and the histories of human beings in their individual and collective identities. General and Old Testament Articles; Genesis; Exodus; and Leviticus New Interpreter's(R) Bible offers critically sound biblical interpretations for the 1990s and beyond. Guided by scholars, pastors, and laity representing diverse traditions, academic experience, and involvement in the Church, this entirely new collection of writings is specifically prepared to meet the needs of preachers, teachers, and all students of the Bible. Volume X: Acts; Introduction to Epistolary Literature; Romans; 1 Corinthians. Volume X contains an excellent Introduction to Epistolary Literature, plus comments on the New Testament books of Acts, Romans, and 1 Corinthians. - The full texts and critical notes of the New International Version(R) and the New Revised Standard Version of the Bible are presented in parallel columns for quick reference and comparison. CD-ROM Version for the full Twelve Volumes is also available. Click here for more details. 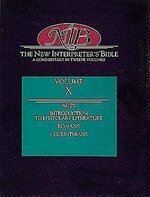 New Interpreter's(R) Bible offers critically sound biblical interpretations for the 1990s and beyond. Guided by scholars, pastors, and laity representing diverse traditions, academic experience, and involvement in the Church, this entirely new collection of writings is specifically prepared to meet the needs of preachers, teachers, and all students of the Bible. 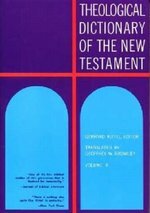 Easy-to-use Format: * Full texts and critical notes: NIV and NRSV * A detailed, critical Commentary providing an exegetical "close-reading" of the biblical text * Reflections that present a detailed exposition of issues raised in the discussion and dealt with in the Commentary Key Features: * The entire Bible (including the Apocrypha Deuterocanonical books) in twelve volumes * Introductions to each book that cover essential historical, sociocultural, literary, and theological issues * An ecumenical roster of contributors * Comprehensive, concise articles * Numerous visual aids (illustrations, maps, charts, timelines) enhance use. Introduction to Wisdom Literature; Proverbs; Ecclesiates. New Interpreter's(R) Bible offers critically sound biblical interpretations for the 1990s and beyond. Guided by scholars, pastors, and laity representing diverse traditions, academic experience, and involvement in the Church, this entirely new collection of writings is specifically prepared to meet the needs of preachers, teachers, and all students of the Bible. 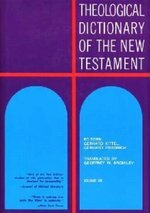 Easy-to-use Format: * Full texts and critical notes: NIV and NRSV * A detailed, critical Commentary providing an exegetical "close-reading" of the biblical text * Reflections that present a detailed exposition of issues raised in the discussion and dealt with in the Commentary Key Features: * The entire Bible (including the Apocrypha Deuterocanonical books) in twelve volumes * Introductions to each book that cover essential historical, sociocultural, literary, and theological issues * An ecumenical roster of contributors * Comprehensive, concise articles * Numerous visual aids (illustrations, maps, charts, timelines) enhance use. Introduction to Apocalyptic Literature; Daniel; THE Twelve Prophets. 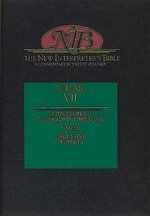 New Interpreter's(R) Bible offers critically sound biblical interpretations for the 1990s and beyond. Guided by scholars, pastors, and laity representing diverse traditions, academic experience, and involvement in the Church, this entirely new collection of writings is specifically prepared to meet the needs of preachers, teachers, and all students of the Bible. 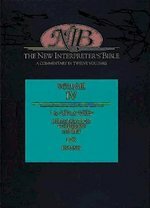 Easy-to-use Format: * Full texts and critical notes: NIV and NRSV * A detailed, critical Commentary providing an exegetical "close-reading" of the biblical text * Reflections that present a detailed exposition of issues raised in the discussion and dealt with in the Commentary Key Features: * The entire Bible (including the Apocrypha Deuterocanonical books) in twelve volumes * Introductions to each book that cover essential historical, sociocultural, literary, and theological issues * An ecumenical roster of contributors * Comprehensive, concise articles * Numerous visual aids (illustrations, maps, charts, timelines) enhance use. 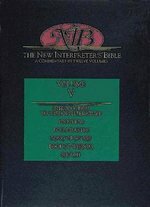 The New Interpreter's(R) Dictionary of the Bible (NIDB) in five volumes provides the best quality in contemporary biblical scholarship on a comprehensive range of topics from the Old and New Testaments, the Deuterocanonical books, and from contextual studies of the ancient Near East and the Greco-Roman worlds and their literatures. The dictionary contains maps, charts, and illustrations to further clarify the written material. The biblical text used is the NRSV translation. In keeping with the tradition of the New Interpreter's(R) Bible brand, the New Interpreter's Dictionary of the Bible aims to fulfill the promise of a standard already set for reliable, accurate, insightful, and highest quality biblical scholarship in service of the congregation. It is our hope that readers will come to associate the dictionary with thoroughness, comprehensiveness, and ease of use: find it here; find it now. With inclusivity comes a certain amount of exclusivity: the contributors are instructed to keep in mind a particular audience - the congregation. With every dictionary entry, authors seek to define their topics in such a way that the entries will be relevant and useful to pastors, rabbis, preachers, teachers, and students in preparing to serve the congregation in a variety of ways. Thus the dictionary tries to balance the best in contemporary scholarship with the perceived needs of the congregation. Theological content and thorough discussion of various interpretations is tailored for congregational use. With the burgeoning use of the internet as a source of information, the unfortunate result can be scattered and uneven coverage of a given topic from unknown and unreliable sources. This dictionary seeks to provide a trusted resource containing comprehensive information based on widely accepted critical tools about a wide variety of topics - all in one place - with cross references to related materials and a searchable CD, so that long and frustrating web searches with unreliable results will no longer be necessary. This dictionary will become the first place Bible readers look for reliable scholarship. The New Interpreter's(R) Dictionary of the Bible (in five volumes) provides the best quality in contemporary biblical scholarship on a comprehensive range of topics from the Old and New Testaments, the Deuterocanonical books, and from contextual studies of the ancient Near East and the Greco-Roman worlds and their literatures. The dictionary contains maps, charts, and illustrations to further clarify the written material. The biblical text used is the NRSV translation. The Pastor's Bible Study(TM), Volume Four, is a focused preparation guide containing fifty Bible studies. The flexible structure is designed to meet the needs of pastors, or others who lead by studies, whether the group meets for four weeks or an entire year. The versatility of this resource allows you to plan according to a canonical, lectionary, or thematic structure. Following the tradition of the The New Interpreter's(R) Study Bible, the Pastor's Bible Study(TM) bridges biblical scholarship and practical reflections. Authors include: Michael W. Newheart, Associate Professor of New Testament at Howard University, Washington, DC; Frank Yamada, Assistant Professor of Hebrew Scriptures at Seabury-Western Theological Seminary, Evanston, IL; E. Glenn Hinson, retired Professor of Spirituality and Church History at Baptist Theological Seminary at Richmond, VA; Uwe C. Scharf, Clinical Pastoral Education Supervisor, Pastoral Services Department, Duke University Hospital, Durham, NC; Kandy Queen-Sutherland, Professor of Religions Studies at Stetson University, Deland, FL; and David Albert Farmer, Visiting Professor of Preaching at Palmer Theological Seminary in Philadelphia and Pastor of Silverside (American Baptist) Church in Wilmington, DE. 50 lessons (enough for a full year) for mid-week Bible study groups or adult Sunday School classes, or for pastors to use for personal study and sermon preparation. Lessons are written by pastor/scholars who are experts in their field and who have personal experience and understanding for the study needs of pastors and congregants. Lessons include links to lectionary passages for ease of use with preaching. Lessons feature questions for personal or group reflection and resources for further study. Lessons include teaching tips to aid group leader in preparing and leading discussion. Lessons are linked to The New Interpreter's(R) Study Bible and refer to the The New Interpreter's(R) commentary series for in-depth commentary. Lessons include a variety of topics, from study of books of the Bible, to personal growth, to Christian responses to current events. Book includes CD with full text of the book, PowerPoint presentations, and study outlines and reflection questions that can be edited, printed, and given to group participants. Volume 4 is part of a projected 10 to 12 volume series that will cover the entire New Testament and most of the Old Testament lectionary passages. Subscriptions are available. Technical support for this product is available weekdays by telephone. 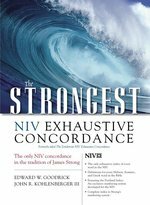 Only one New International Version concordance provides an exhaustive indexing of every appearance of every word in the NIV Bible: The Strongest NIV Exhaustive Concordance. It also offers complete access to the Hebrew, Aramaic, and Greek from which the NIV was translated. Feature for feature, this Gold Medallion Award-winning volume is by far the most powerful NIV concordance available. 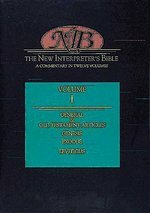 Features Complete alphabetical listings for every word in the NIV Thorough dictionary-indexes define every Hebrew, Aramaic, and Greek word in the Bible, including the possible meaning of every proper name Exhaustive listing of every NIV translation for a given word; all related words shown in the original languages All references listed in biblical order All words cross-referenced to spelling variations and variant forms More than 2,000 key words from the KJV cross-referenced to their NIV equivalents Special typefaces indicate the word or words used in the NIV translation for all Hebrew, Aramaic, and Greek terms Unique numbering system developed by Goodrick and Kohlenberger (G/K) eliminates the inherent gaps, flaws, and inaccuracies of the old Strong s numbering system Special indexes allow for easy cross-referencing between the G/K numbering system for those using reference books keyed to Strong s numbers"
One of the most widely respected theological dictionaries put into one-volume, abridged form. Focusing on the theological meaning of each word, the abridgment contains English keywords for each entry, tables of English and Greek keywords, and a listing of the relevant volume and page numbers from the unabridged work at the end of each article or section. Kittels Theological Dictionary of the New Testament is simply the most in-depth word study tool available. It contains articles on significant theological words in the New Testament, covering their usage in the Old Testament, their secular Greek background, their use in sources such as Josephus, Philo, pseudepigraphal and rabbinical literature, and their use in the New Testament. Where relevant, a subsection on a words use in the Apostolic Fathers is provided. Volume 4 contains entries from Lambda to Nu. 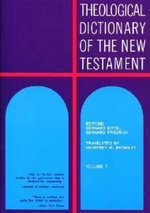 This monumental reference work, complete in ten volumes, is the authorized and unabridged translation of the famous Theologisches Wvrterbuch zum Neuen Testament, known commonly as Kittel and considered by many scholars to be the best New Testament Dictionary ever compiled. 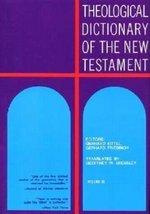 Mediating between ordinary lexicography and the specific task of exposition, TDNT treats more that 2,300 theologically significant New Testament words, including the more important prepositions and numbers as well as many proper names from the Old Testament. Presenting the words in the order of the Greek alphabet, TDNT typically discusses the following for each word: its secular Greek background, its role in the Old Testament, its use in extrabiblical Jewish literature, and its varied uses in the New Testament. Substantial bibliographies and footnotes supplement the articles. Kittels Theological Dictionary of the New Testament is simply the most in-depth word study tool available. It contains articles on significant theological words in the New Testament, covering their usage in the Old Testament, their secular Greek background, their use in sources such as Josephus, Philo, pseudepigraphal and rabbinical literature, and their use in the New Testament. Where relevant, a subsection on a words use in the Apostolic Fathers is provided. Volume 8 contains entries from Tau to Upsilon. 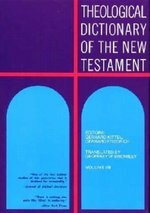 Kittels Theological Dictionary of the New Testament is simply the most in-depth word study tool available. It contains articles on significant theological words in the New Testament, covering their usage in the Old Testament, their secular Greek background, their use in sources such as Josephus, Philo, pseudepigraphal and rabbinical literature, and their use in the New Testament. Where relevant, a subsection on a words use in the Apostolic Fathers is provided. Volume 9 contains entries from Phi to Omega. This multivolume work is still proving to be as fundamental to Old Testament studies as its companion set, the Kittel-Friedrich "Theological Dictionary of the New Testament," has been to New Testament studies.The "TDOT" volumes present in-depth discussions of the key Hebrew and Aramaic words in the Old Testament. Leading scholars of various religious traditions (including Roman Catholic, Lutheran, Reformed, Anglican, Greek Orthodox, and Jewish) and from many parts of the world (Denmark, France, Germany, Great Britain, Greece, Israel, Italy, the Netherlands, Norway, Sweden, Switzerland, and the United States) have been carefully selected for each article by editors Botterweck, Ringgren, and Fabry and their consultants, George W. Anderson, Henri Cazelles, David Noel Freedman, Shemaryahu Talmon, and Gerhard Wallis.The intention of the writers is to concentrate on "meaning," starting from the more general, everyday senses and building to an understanding of theologically significant concepts. To avoid artificially restricting the focus of the articles, "TDOT" considers under each keyword the larger groups of words that are related linguistically or semantically. The lexical work includes detailed surveys of a word's occurrences, not only in biblical material but also in other ancient Near Eastern writings. Sumerian, Akkadian, Egyptian, Ethiopic, Ugaritic, and Northwest Semitic sources are surveyed, among others, as well as the Qumran texts and the Septuagint; and in cultures where no cognate word exists, the authors often consider cognate ideas. "TDOT'"s emphasis, though, is on Hebrew terminology and on biblical usage. The contributors employ philology as well as form-critical and traditio-historical methods, with the aim of understanding the religious statements in the Old Testament. 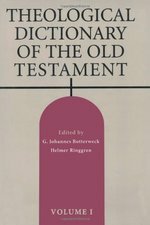 Extensive bibliographical information adds to the value of this reference work.This English edition attempts to serve the needs of Old Testament students without the linguistic background of more advanced scholars; it does so, however, without sacrificing the needs of the latter. Ancient scripts (Hebrew, Greek, etc.) are regularly transliterated in a readable way, and meanings of foreign words are given in many cases where the meanings might be obvious to advanced scholars. Where the Hebrew text versification differs from that of English Bibles, the English verse appears in parentheses. Such features will help all earnest students of the Bible to avail themselves of the manifold theological insights contained in this monumental work." Beginning with 'ābh ('āb), -father, - and continuing through the alphabet, the TDOT volumes present in-depth discussions of the key Hebrew and Aramaic words in the Old Testament. Leading scholars of various religious traditions (including Roman Catholic, Lutheran, Reformed, Anglican, Greek Orthodox, and Jewish) and from many parts of the world (Denmark, France, Germany, Great Britain, Greece, Israel, Italy, the Netherlands, Norway, Sweden, Switzerland, and the United States) have been carefully selected for each article by editors Botterweck, Ringgren, and Fabry and their consultants, George W. Anderson, Henri Cazelles, David Noel Freedman, Shemaryahu Talmon, and Gerhard Wallis. 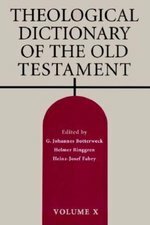 This English edition attempts to serve the needs of Old Testament students without the linguistic background of more advanced scholars; it does so, however, without sacrificing the needs of the latter. Ancient scripts (Hebrew, Greek, etc.) are regularly transliterated in a readable way, and meanings of foreign words are given in many cases where the meanings might be obvious to advanced scholars. Where the Hebrew text versification differs from that of English Bibles, the English verse appears in parentheses. Such features will help all earnest students of the Bible to avail themselves of the manifold theological insights contained in this monumental work. 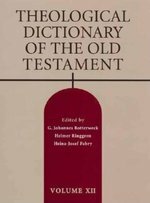 Volume XII of the highly respected "Theological Dictionary of the Old Testament" expands the scope of this fundamental reference tool for biblical studies. 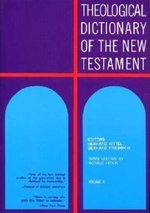 Ranging from "pāsah, pesah" ("Passover") to "qUm" ("stand, rise"), these eighty-six articles include thorough etymological analysis of the Hebrew roots and their derivatives within the context of Semitic and cognate languages, diachronically considered, as well as Septuagint, New Testament, and extracanonical usages. Among the articles of primary theological importance included in Volume XII are these: "par'ōh" ("Pharoah"), "pāsa, pesa;" ("sin, offense, crime"), "sebāOt" ("Sabaoth"), "sādaq, sedeq, sedāqA" ("[be] righteous, righteousness"), "qds, aōdes" ("holy"), and "qāhāl" ("congregation"). Each article is fully annotated and contains an extensive bibliography with cross-references to the entire series.